Welcome back to our blog here at Dynamic Measurement and Control Solutions. 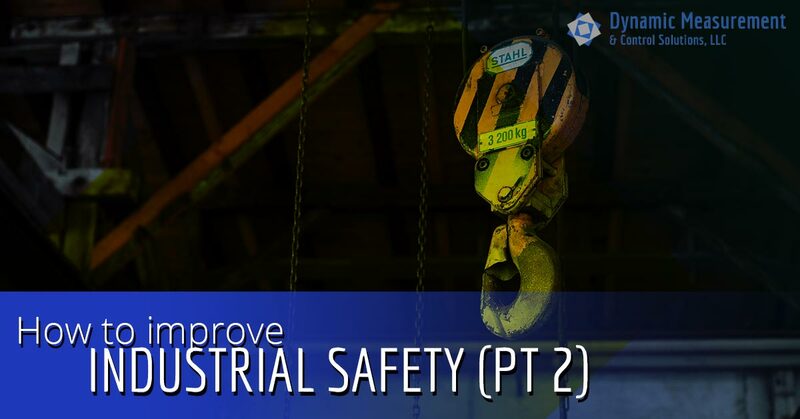 This is part two of our blog series about improving industrial safety in your workplace. Whether you’re just launching your company or you already have a well-established safety protocol, there’s never a bad time to reevaluate your employees’ safety while on the job. Keep reading or contact us today to learn more. Without effective communication throughout your company, how will your employees be able to notify management when there’s a potential safety hazard? Your employees, from the moment they’re hired, should be encouraged to speak up about anything that seems unsafe or any machinery that isn’t working correctly. The sooner supervisors and management find out about these issues, the sooner they can be taken care of. Sometimes improving the safety of your workplace can be as simple as improving your employee training. All too often, safety training is just thrown in with the rest of an employees training and isn’t given any real significance other than being a part of the protocol. You can emphasize the importance of safety on the job by dedicating a day to safety training or at least training employees in safety separately from the rest of their training. This will teach employees from the moment they start working that safety always comes first. Just like you’re always looking for ways to improve the efficiency of your company, save money, or increase revenue, you need to always be looking for ways to improve workplace safety and encourage your employees to do the same. It may be helpful to have regular meetings based on safety in order to give your employees the opportunity to address any safety concerns they may have or suggestions on how to improve company-wide safety protocol. Safety isn’t just about workers being aware of the dangers on the job (although that is certainly an important aspect). Safe workspaces are also controlled by how much you invest in it. Does your manufacturing facility have enough caution signs reminding employees of potential hazards? Do all the emergency lights work in your automation systems? Do you schedule regular maintenance for any machinery? Are chemicals and other substances labeled and stowed correctly? These are all very important aspects of maintaining a safe work environment. DMCS is your full-service engineering consulting firm in Northern California. With 20 years of experience, we’ve worked with companies of all different sizes and industries. It’s our highest priority to learn exactly what your automated manufacturing needs are and do everything we can to help you accomplish them. Does your company need a safety overhaul? Contact Dynamic Measurement & Control Solutions today and we’ll help you determine the best way to make this happen.